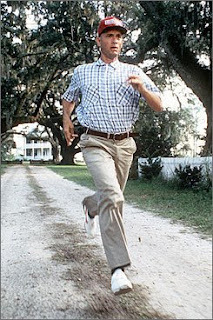 Short version is that I started running in '99 approaching my 40's going through a life change--much like Forrest Gump. I ran and ran and ran, (Just like Forrest) and learned they actually organize races where it's not just running by yourself. My mistake was getting a tiny trophy in my first organized 5K in my age group. I didn't realize, I had a lot of built up energy and did okay--that got me hooked on running. After running short distances forever, I started telling my significant other (now wife) that someday I'd like to try a marathon. I got Hal Higdon's book for Christmas and the addiction went to a whole other level. I ran my first marathon with no training and training with the mere guidance from Al's book in 2008 at the San Diego Rock and Roll Marathon. I ran a 3:42. I thought that was good, but was disappointed I didn't hit 3:30. I overtrained in 2009 and ran two marathons; San Diego and Chicago. The later I ran (unbeknownst to me at the time) on a stress fracture in my left tibia. That combined with a late start and high temperatures, I once again fell short--this time two minutes of my 3:30 goal. I have been re-habbing since and starting my official marathon training program next week for the CIM in December. I hope to blog about my progress along the way.